Whoever you are, wherever you live, whatever your style, Owens Corning has a shingle line that is right for you. 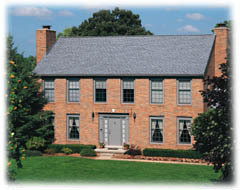 Whether you prefer the distinctive look of our Berkshire® Collection shingles, the extreme weather protection of our WeatherGuard® HP Shingles, the dimensional look of our Oakridge PRO® Series shingles, the traditional look of our 3-Tab shingles, or our Roll Roofing for special applications, you can be sure that every Owens Corning shingle delivers beauty and performance. Distinctive and eye-catching, a Berkshire® Collection roof expresses the bold unique style you’ve always wanted for your home – a look people can’t help but notice. For the newest dimension in roofing, look to Oakridge PRO® Series shingles. The full range of color blends and shadow lines add irresistible appeal to any roof.